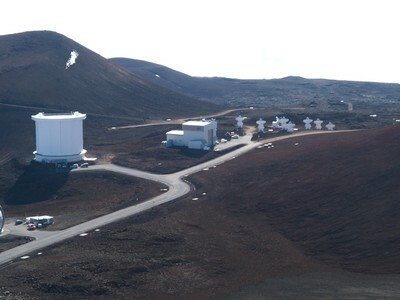 The west side of the telescope collection. From left to right:  Caltech Submillimeter Telescope (CST)…just a tiny silver sliver shows on the left edge of the image;  James Clerk Maxwell Telescope (JCMT); and,  the Submillimeter Array. Note the patches of snow.